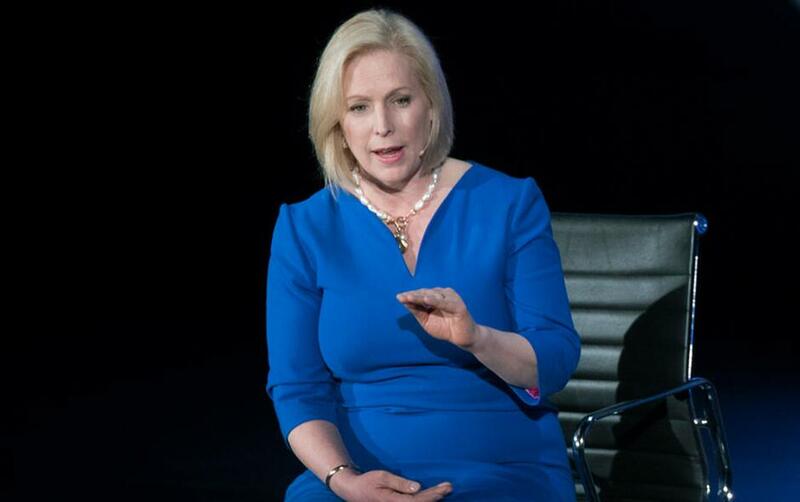 Sen. Kirsten Gillibrand, D-N.Y., speaks during the ninth annual Women in the World Summit, Friday, April 13, 2018, in New York. NEW YORK (AP) — One after another, the speakers attacked President Trump's policies as discriminatory, his rhetoric as hateful and his motivations as bigoted. The fiery rhetoric, from nearly a half dozen Democrats who may seek the White House in 2020, came as hundreds of African-Americans gathered in New York City on Friday to contemplate the first year of the Trump presidency and to begin sizing up his possible replacement. Trump "is what the darkness looks like," said Sen. Kirsten Gillibrand. "He is what the darkness sounds like." Yet Cory Booker, one of just two black Democratic senators, cautioned his party against adopting the same divisive language about Trump that he uses against his political adversaries. "I am tired of people allowing someone who preaches hate to turn us into haters, someone who spews darkness to make us go dark, someone who's trying to divide make us attack other people," Booker declared, later suggesting that poor voting rates among African Americans led to Trump's 2016 victory. "We did it to ourselves," he said. Neither Gillibrand nor Booker has declared their intentions for the 2020 presidential contest, which is barely a thought for most voters. Yet they are considered likely candidates in what is expected to be a crowded Democratic field that lines up to take on Trump. Friday's program also featured 2020 prospects Vermont Sen. Bernie Sanders, Massachusetts Sen. Elizabeth Warren and California Sen. Kamala Harris. Al Sharpton, whose National Action Network hosted the event, referred to the Democratic senators as "presidential candidates." "None of them have announced," Sharpton explained. "They're on what we call a temperature tour. They're trying to test the temperature to see if they should announce." The ambitious Democrats are eager to connect with the black community, which plays a critical role in the presidential primary process on the Democratic side. In 2016, Sanders struggled to defeat Hillary Clinton in the party's nomination fight partly because of his weak relationship with black voters. He and others worked Friday to improve the relationship going forward. And Trump, who has embraced xenophobia, if not racism at times, made for an easy target. "The pendulum is swinging backward," Harris, the party's only other African-American senator, warned after highlighting the progress made by the civil rights movement over the last five decades. Sanders described Trump as "perhaps the worst president in the history of our country." "The worst thing that he is doing is trying to divide this great country up based on the color of our skin or the country that we come from or our religion or our sexual orientation," Sanders said and later added a pointed message at the White House: "Mr. Trump, we are not going backward toward bigotry. We are going forward toward justice." Beyond rhetoric, most of the speakers charged that the president has adopted and promoted discriminatory policies on education, criminal justice, the economy and housing. Warren noted, for example, that studies consistently find that black families have a harder time getting mortgages; and when minorities obtain mortgages, they often pay more for them than white people. The Census Bureau reported at the end of last year that the homeownership rate among white people was 73 percent. Among black Americans, it was just 42 percent. "I know I haven't personally experienced the struggles of African-American families, but I am here to say that no one can ignore what is happening in this country," Warren said. She added, "All our fights are interconnected." White House spokeswoman Sarah Huckabee Sanders dismissed the Democrats' attacks, noting black unemployment has reached a record high under Trump's leadership, while he has paid special attention to historically black colleges and universities and promoted "school choice" programs that would expand options for parents in bad school districts. "They should focus more on policies that actually help people instead of grandstanding speeches to attack the president," Sanders said.